This sign is perfect for anyone who works the night shift and sleeps during the day. It's also great for parents who don't want people waking up their kids during nap time. Just put it on your front door whenever you need it. This one is a lovely gold color, but I also offer other color options in my shop. 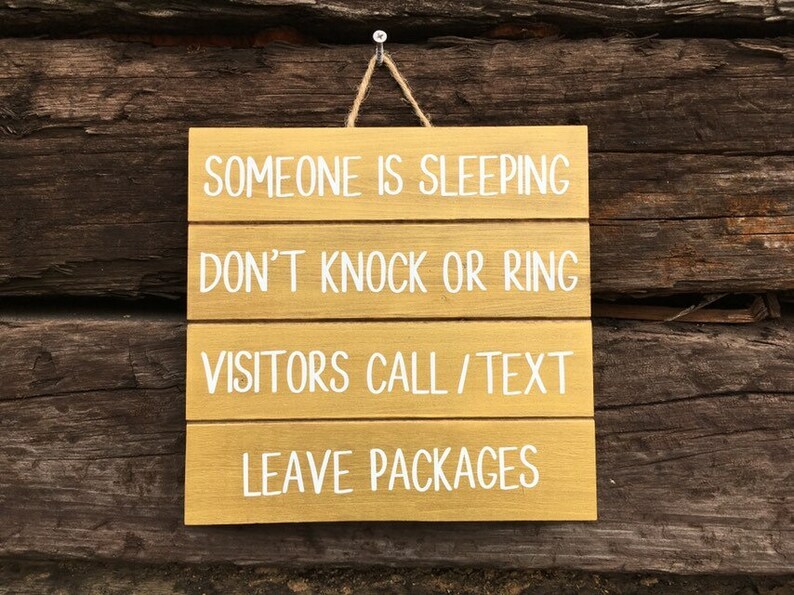 "Someone is sleeping - Don't knock or ring - Visitors call or text - Leave packages"
This wooden sign is painted, sealed, and decorated with outdoor grade vinyl for durability. Measures approximately 10 x 10 inches. Since each item is handmade, there will be slight differences in each one I make and wood grain and knots will be different from what you see in this picture. Order processing time is 2-3 days. Let me know the occasion and I will do my best to match the wrapping. If no occasion is specified, I will wrap neutrally. I'm glad I found a apron for my fiancé that didn't have some kind of innuendo on it. The only think I didn't think about is that it doesn't have a pocket, but I will probably sew one on! Super cute, rustic ornaments that were great gifts!